Catch A Fire eased from the outside gate to settle last. Strykum held them out and Young Amazon made Just One Moment do a bit of work before she let her go. Effortless Miss held the box seat. Sistine Spirit was in the clear around Sebring Sally. Strykum had them bunched right up in the middle stages and travelled easily, putting Just One Moment under a bit of pressure. Runs came from the back from Grey Street and Catch A Fire was weaving through from the back. Strykum kicked around the turn and got away from Just One Moment and Sebring Sally got into the clear to run on. Catch A Fire was still working her way through and Grey Street’s run was coming to an end. Strykum was never in danger the way the race was run and she cruised in. Just One Moment just held second with Sebring Sally and Catch A Fire hitting the line together very close up. Follow: Catch A Fire was up against it the way the race was run but caught the eye. Leveraction wanted the lead and found it over Magnatune and Strong Hand was up there too. Ustinov’s Fury was crowded a bit on the fence inside Rainbow Storm also over racing. Scherzoso made it up to three back on the rails after a fair start with Gerontius and So Does He caught three wide. Leveraction ran along midrace and opened about three lengths on Strong Hand getting past Magnatune. So Does He couldn’t get in and kept moving forward with Rainbow Storm just ahead of him, Schersozo was shuffled back to near last at the 600m. Strong Hand was being urged along to chase Leveraction nearing the turn and was seemingly not making an impact. So Does He made it to third but hard pressed around Rainbow Storm and Magnatune, also pressured. Schersozo was second last on the fence. Strong Hand levelled up with Leveraction at the 200m and they raced right away from Rainbow Storm holding down third. Strong Hand just did enough to worry Leveraction out of it to make it four straight. Rainbow Storm ran an improved race second-up while Gerontius and Magnatune were next. Schersozo got out way too late and his run should be forgiven. Count Of Limonade fired up from wide out and pushed for the lead, Temps Voleur and Vizhaka help him honest and Shenzhou Steeds landed in fourth. Honourable Aussie and Prizum were the next pair and Try Four stuck three wide. Albonetti was sent straight back to last. Count Of Limonade opened right up and led by some eight lengths down the back. Temps Voleur and Vizhaka were left to cart the field up and Shenzhou Steeds waited on the fence. Try Four was gone at the 600m and Albonetti tried to get around him and make some ground but was hard at it. Count Of Limonade was a spent force near the turn but still led by a couple, Temps Voleur was closing but ran in a little and Shenzhou Steeds was slightly hampered. Vizhaka was gone and Prizum pushed him out of the way to get clear. Albonetti was widest. Temps Voleur hit the lead past the 200m but he was also looking for the post as Shenzhou Steeds, Prizum and Albonetti ran on. In a tight finish Temps Voleur just held on over Shenzhou Steeds, but the stewards reversed the placings following a protest. A bit controversial, there wasn’t much in it and the tiring leader was a contributor. Prizum did his thing running a place and Albonetti a shade disappointing given the strong pace but still a good effort. Follow: one more try Albonetti. Tawteen broke okay and was taken on for the lead by Written Dash out wide but she held her out. Cobblestones was between them and Catch That Cat took a trail. Forgeress was caught wide and hard ridden a long way from home in the second half around Pilly’s Wish and Flash Of Doubt while Precious Gem trailed them. Tawteen was able to get control as Written Dash sat up to her outside. Catch That Cat was going well behind the leader while Forgeress was going backwards before the turn. Tawteen broke away on turning and opened up a few lengths on Catch That Cat under pressure, Precious Gem tried to sweep home out wide and Pilly’s Wish was getting through on the rails. Tawteen ran to the line untroubled and was too good for them. Pilly’s Wish arrived in time to cut Catch That Cat out of second and Precious Gem was excellent first-up right alongside. Forgeress got going again in the straight in a strange run and was only beaten a few lengths. They basically handed it to the winner who was the best horse in the race. Follow: Precious Gem a promising fresh effort. A heap of early pressure with Living On A Prayer wide out and Just For Starters trying to cross Solsay, Valiant Warrior and Churchill Dancer. A couple to Mighty Like three wide around Sardaaj and Stingray improving after a slow start. Just For Starters eventually made it to the fence over Valiant Warrior, while Living On A Prayer was left stranded. Churchill Dancer had the gun run and managed to slip up on the inside of Just For Starters near the turn to take over. Solsay followed him while Sardaaj became held up between Solsay and Living On A Prayer and behind a weakening Valiant Warrior. Mighty Like didn’t help her cause slipping up wider out. Churchill Dancer bounded clear around the turn and was home and hosed 200m out. Solsay and Just For Starters were staying on while Valiant Warrior and Mighty Like battled, Sardaaj didn’t get clear until 100m out and she flashed home into second place from Solsay and Just For Starters, the latter doing not a bad job considering and Stingray close up. Forgive Mighty Like and wait for him at 1400m. Churchill Dancer very impressive on the back of a nice first-up run and he goes even better at Flemington. Sardaaj should have finished a lot closer first-up. Follow: Sardaaj looks very handy. Boston Light was last out then improved to about midfield on the fence. Well Sprung and Danuki crossed to lead pretty easily from Vicious around Gold Busker, who got his head up and over raced behind the speed. Odyssey Moon found himself three wide without cover and no hope of getting in. El Greco was in that bunch around Boston Light. Well Sprung had them stacked up with Danuki still on his outside while Odyssey Moon strode up to third. All the chasers were put under pressure when Well Sprung upped the tempo nearing the turn. Danuki was sticking with him while Odyssey Moon also stayed on after his wide run. Gold Busker and Vicious couldn’t pick up and El Greco peeled out to try to run on. Behind them Boston Light had nowhere to go. Well Sprung held them all at bay and was strong on the line beating Danuki. Odyssey Moon just beat El Greco for third in a good effort and Boston Light had no luck another length or so away. Don’t write off Manhattan Blues on his first-up effort, he worked home nicely when the race was all over. Follow: could be a good form race, Odyssey Moon, Boston Light and Manhattan Blues. Our Nkwazi bombed the start. Up front there was a line of three with Sweet Emily kicking up inside Il Cavallo and She’s Ellie three out. Tansy had the box seat with Just Magical and Gregers three deep with over. Eclair Choice wasn’t the best out but made it to midfield on the fence, Le Bonsir outside him. Sweet Emily broke away 400m out but was being pushed along, Il Cavallo still travelled okay while She’s Ellie dropped off. Just Magical worked into the clear on the turn while Tansy waited and Gregers pulled out to try and make ground. Eclair Choice was held up and Le Bonsir got a dream run through behind Just Magical who hit the lead inside the 200m. Le Bonsir sprinted quickly to join Just Magical in the closing stages and finished the race off a little too well. Il Cavallo scrambled into third from the fast finishing Klishina and the luckless Eclair Choice. Gregers seemed to have her chance behind them. Fast Cash was never in the call but did pick up a bit of late ground, probably burnt off at the 1000m fresh. Follow: Eclair Choice can be forgiven. Supreme Warrior had a flying start and had the early lead until Letmedowngently headed him at the first turn. Volontiers and Upbeat let them go. Kenjorwood couldn’t get up on the speed and wast stuck three deep around Abbasso and Almoonqith about midfield. Letmedowngently took control and Kenjorwood whipped up to sit second, giving cover to Supreme Warrior around Upbeat. Somehow Volontiers ended up three wide in that shuffling and Abbasso remained held up in the middle. Kenjorwood tried to serve it up to Letmedowngently coming to the turn but the leader had a kick. Almoonqith ran up behind the leader, Abbasso worked into the clear off Kenjorwood’s heels, Supreme Warrior was just starting to paddle and down the outside came The United States. Abbasso was being hailed the winner at the 50m as he joined Letmedowngently, Kenjorwood tried to rally but The United States swamped them in the last few strides for a stunning first-up win. Just behind them Almoonqith wasn’t a bad effort either. Every chance Abbasso and Letmedowngently was game again. Follow: The United States showed promise last year before going amiss and looks to have come back better. Miss Mossman worked to the front over Westsouthwest with Reigning not far off without cover. Sir Laszlo and Kareeming were the next pair, the latter getting into a nice spot off his wide gate. Back To Abeline and You Think So followed and At First Sight was around midfield. Reigning was taken to the front about half way home over Miss Mossman with Westsouthwest getting a nice run, as was Kareeming a couple away. Not a lot of change down to the 600m though they did start to bunch a little. Reigning had the better of Miss Mossman at that point, Kareeming peeled out three wide to chase and Westsouthwest waited. 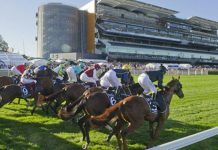 Sir Laszlo and You Think So were hard at it, At First Sight tried to run on wider out and next was Sir Mako stealing runs on the rail. Kareeming got to Reigning about 100m out with Westsouthwest one paced on the rail. Sir Make got around their heels to run on clear of Sir Laszlo and At First Sight. Sir Mako finished best, in a sharp improvement on his last run in a similar race, to blouse Kareeming and Reigning with Westsouthwest close up on the fence. At First Sight didn’t back up. Follow: hard to follow the staying form in this class. Specials from the meeting: Catch A Fire, Sardaaj, Odyssey Moon, The United States. When they got going in the first Inner Circle was first out but Voilier was racing it on the inside for the early lead and the pace was good. 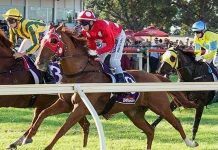 Sebring Sun was sent out a short priced favourite and didn’t begin well and went back to last, giving up a good start. Eventually Inner Circle crossed and put up a good lead in front. Shards got a good run in third, just smoking its pipe. Around the turn Inner Circle still had a good lead, but as they topped the rise, Voilier was heading out after it. It hit the front inside the furlong, and then Voilier was next to challenge with Sebring Sun coming home hard from the back. In the last 50m I like the way Shards dug in and came away on the line. This looked like a win of a horse who will improve further. Realistically, the first four home all went fairly well here and it could be a good form race. Follow: Good form race, the first four can win races, the winner will improve. In the second, Two Blue was the first out, with Il Mio Destino going up to join it in the lead. Echo Gal took a nice sit in third spot. Mid race Il Mio Destino went clear in front and Echo Gal came off the fence around Two Blue. In the straight, Echo Gal was the first to put in a sprint for victory, as Amicus looked to wind up down the outside and Wine Tales was caught in the pinball machine in the middle looking for runs and having something to offer. In the run to the line, the class prevailed and Amicus wore down Echo gal. Wine Tales was out late and made ground, but it was all too late. Wine Tales was the “unlucky” story of the race, but such can be the case with horses that get back and run on. Follow: Wine Tales unlucky, but be mindful of racing pattern. Lucky Meteor and Straturbo set up a decent pace in front here. Grand Condor initially showed pace and the eased into a trailing position. Whilst All that was going on, Blake Shinn would have been chuckling as he was able to put Fell Swoop straight in behind them getting a lovely run from the get go. In the straight this race was a case of Fell Swoop being an above average horse, and having been given an above average ride. He sprinted very well and the issue was fairly painless for anyone who took the shorts. The last 600m was easily the best of the day in 33.66, which you would expect, but getting down that low is still a very good effort. Music Magnate ran very well in second and is one to follow. The rest were just runs. 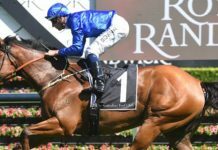 Follow: Fell Swoop a good horse, Music Magnate unlucky to run into it. The Silver Shadow for the fillies was race four, and Kangarilla Joy began brilliantly and went to an early lead, but Speak Fondly was allowed to get into its stride and go forward on the fence to take it up as many would have expected. Lake Geneva and Fireworks got nice trails in third and fourth. Kimberley Star who brought good form into the race went back to last with Italy. Around the turn and up the rise they all were going ok, but none better than Speak Fondly who had not been let go. McEvoy started to give her a push just before the furlong pole and she found some more as Kimberley Star mounted a challenge down the outside. In the run to the line, Speak Fondly held Kimberley Star easily, but it was a decent effort from the second horse to run away from the rest of the field. The last 600m here was 34.04, which highlights the effort of the second horse, and shows that it was a well judged ride in front by McEvoy. It was a bit of a patchy start in the fifth, but when they settled, Himalaya Dream took up the running from Marseille Roulette. El Sasso and Kurtley dropped into nice trailing positions in third and fourth. Around the turn and up the rise they were all over the place with El Sasso making its run along with Kurtley and Bring A Ring. Down the outside, Bold Circle and Forget were winding up, and soon after they looked the two to fight it out. They had a good tussle, with Forget getting the nod on the line. Spy Decoder finished off ok from well back. Sasenkile was first up in this event and put in a very pleasing effort to show that it will be on track when the distances increase. Follow: Sasenkile is set for a good prep. Bold Circle had betting support, where there’s smoke? The big one of the day was The Warwick Stakes, with Kermadec going straight back to the rear. Zaratone did as it does and went to the front with Pornichet going up on its outside into second.Messene got a nice run in third as did Royal Descent in fourth. After going back early, Kermadec found itseld in a midfield spot on the fence, which was a pretty handy piece of riding. The lowlight of the race was Burbero breaking down on the point of the home turn, this took Complacent off the track also. Inside the 300m, Pornichet layed it down to Zaratone and Royal Descent was looming on the outside. In the run to the line, Royal Descent made use of the good run it had in the race, to break its winning drought. Pornichet will improve off the back of this, and Messene may be coming back into form. Plenty were talking up the effort of Kermadec, which was a good run, but I wouldn’t be getting overly carried away given Moriarty also worked home from the back and wasn’t that far behind it on the line. Countryman was out quickly in race seven, as was Boss Lane and Decision Time. Decision Time took it up when they sorted themselves out, with Vashka in second and Boss Lane in third on the outside. Countryman settled back behind them outside of Heart Testa. When they spun the bend they all looked to travel well, with nobody getting too anxious. Decision Time gave a kick early in the straight, but looked like it would be run over at the furlong as Heart Testa came off the fence, Vashka was extending as was Boss Lane. As it turned out, Decision Time kept bobbing in the run to the line and got the money. Vashka will improve for the run. Out of the placings, Aomen made up plenty of ground in the run to the line. The last event extended out to the 2000m and when they settled it was Tradtri in front. In the back straight Zayam went around them to be second on the outside with Chastened getting a good run on the fence in third. The pace looked genuine as the field strung out. Loophole had a nice run, one out and one back. Up the rise, Tradtri still had the front but Loophole ambled up pretty easily and “The Pumper” had a confident look around before he went for home. As that was going on, Artibai was in traffic looking for a run, and by the time he got out, the bird had flown. Cassidy rode hard on the winner in the final part and he was holding Artibai in the run to the line. Scottish Border and Dream Folk put in decent efforts in third and fourth respectively.